he has been sending photos to taunt me and to share. here is another of his first deer. Doesn't he know that the orange vest is supposed to be on him and not the gun? lol Paul we got SWMBO to make us that polarfleece cover to go over the neoprene one on the suppressor to stop it "tinging" when pushing through the tight scrub......... we have fluro vests/coats and daybags too. well guys I reckon we will have a very hard time getting the young fella to come home now!!!!!! hopefully he will be along soon to add story. this is a special place for our family,sort of a right of passage having your photo taken here.our family have hunted this area for 40+ years. as for the other photo MOST of us walk in the first time,a good mate was flying in and spare seat in the boot leather saver...."would you like a ride in??" "does a bear pooh in the woods?" 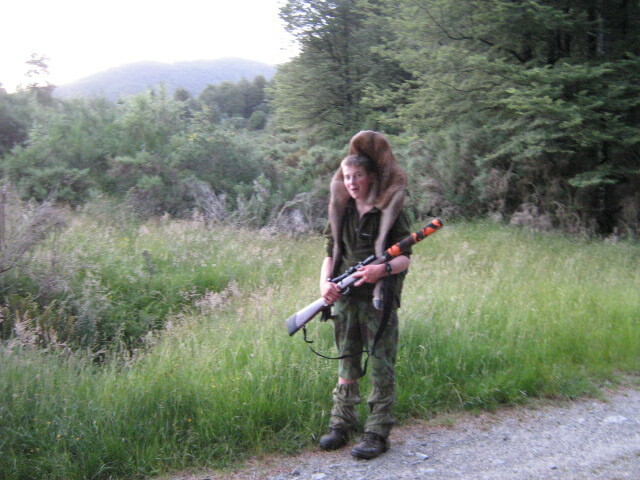 Not really a good way to carry a dead critter, could get shot by another hunter.